Hello e-readers! Will Richard here, once again choosing a specimen for you. And to say good bye (I am soon off to pastures new) I’ve gone for a giant. The biggest in its Class…. Elephant birds, of the family Aepyornithidae, were native to the island of Madagascar. They are thought to have been amongst the largest birds ever to have lived (not counting dinosaurs) reaching three metres high and weighing almost half a tonne. To put that into context, other things that weigh about 500 kilogrammes are: a blue whale’s heart, half a Nissan Micra or 8.1 humans. Unsurprisingly, elephant birds could not fly. The heaviest birds alive today that can are thought to be male kori bustards, which weigh just over 20 kilogrammes at their largest: so it’s about 25 bustards per elephant bird. Instead, like the other ratites (ostriches, emus, cassowaries, kiwis and rheas) they kept their feet on the ground, relying on size, speed and a strong kick to defend themselves. Although elephant birds would at first glance seem most akin to ostriches, particularly in their lifestyle and geography, recent DNA analysis suggests that, in fact, their closest living relatives are the humble kiwis. The largest kiwis weigh just 3.3 kilogrammes however, so elephant birds were at least 151 times their size. Their eggs were also huge. Examples have been found with a circumference of more than a metre and a volume seven times greater than that of an ostrich’s or 160 times that of a chicken’s. It is probable that, like other large ratites, these giant eggs would have needed incubating for about six weeks. The chicks would have gone on to reproduce themselves at between two and three years and a healthy female could lay more than 20 eggs in a breeding season. 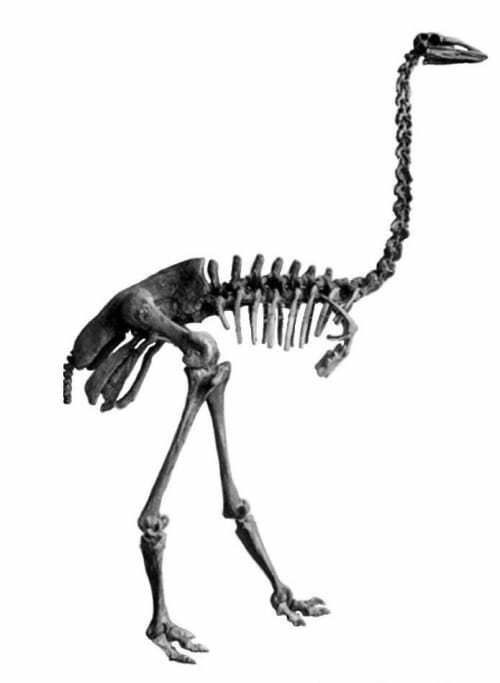 Elephant bird skeleton. Image from Quaternary of Madagascar by Monnier, 1913; via Wikimedia Commons; in the public domain. Although there are a number of suggestions, most researchers agree that elephant birds were driven to extinction by humans, who first arrived on Madagascar about 1500 years ago. This is not unusual. There is a pattern of large animals disappearing at about the same time as significant human populations are first established on islands and the giant aye-aye, another big resident of Madagascar, went extinct about 1,000 years ago too. In the case of elephant birds there is scattered archaeological evidence of butchered bones, however it seems that the majority of human predation focussed not on the adults but on their eggs. It makes sense: why risk a disembowelling from a 10 foot parent when you can poach an egg quite safely? We know that the shells were used as bowls and tools until as late as the 19th Century, but it is almost certain that the actual birds disappeared much earlier. Kristina Guild Douglass; What Killed Off the Giant “Elephant Bird” of Madagascar? 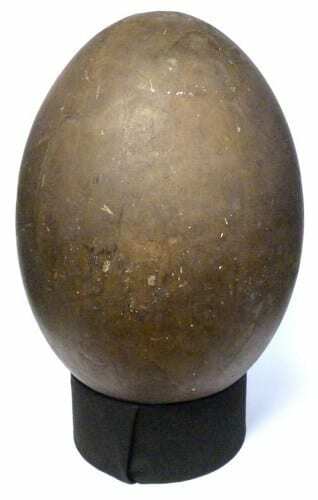 Readers may like to know that there is more about the giant eggs of the Elephant Bird in Vol. 30 (2), October 2014 of “The Linnean Newsletter & Proceedings” see the link above.